Considered helpful with chronic emphysema, asthma, chronic bronchitis and for allergies with symptoms that settle in the lungs. Helps maintain bronchial function and a healthy breathing. The tonifying herbs in this formula strengthen the lungs and makes them less susceptible to future attacks. 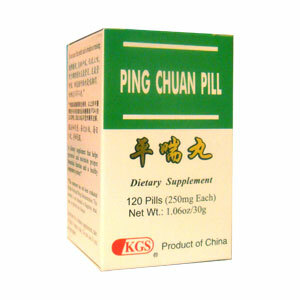 Ping Chuan Pill is used for coughing and difficulty in breathing which is worse in the evening or after overexertion, or in the presence of a common cold. It is often recommended in cases of chronic lung weakness with heat, with symptoms of dry cough and sticky phlegm. Considered helpful with chronic emphysema, asthma, chronic bronchitis and for allergies with symptoms that settle in the lungs. Helps maintain bronchial function and a healthy breathing. The tonifying herbs in this formula strengthen the lungs and makes them less susceptible to future attacks. Tonifies Qi, stops cough, resolves phlegm, tonifies kidneys. Use for cough and difficulty in breathing due to weak kidney rooting of the lungs, with systemic deficiency of Qi. Chronic asthma, emphysema, cough and shortness of breath, and chronic bronchitis. Take 10 pills each time, 3 times daily.